JOIN US FOR AN (ALMOST) AUTHENTIC EDWARDIAN BANQUET — IN (ALMOST) AUTHENTIC COSTUME! 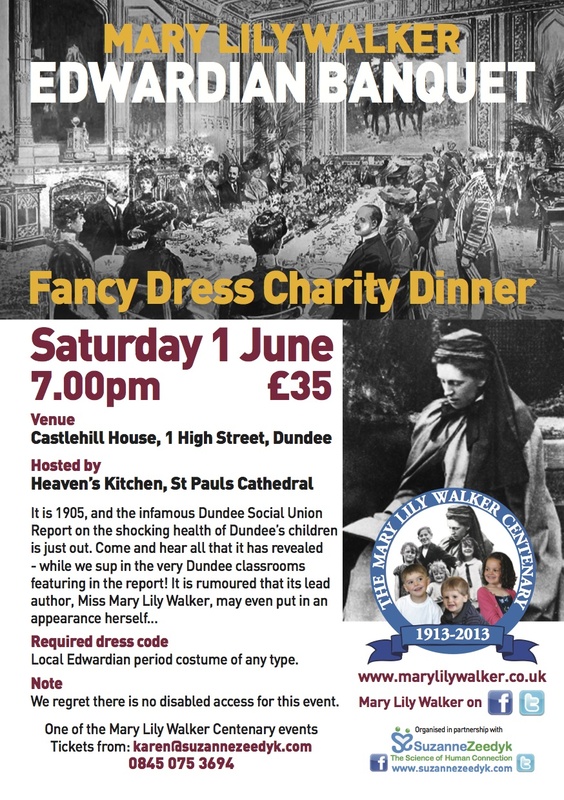 The team at Heaven's Kitchen are hosting an Edwardian Banquet, on Saturday 1 June 2013 — as part of the Mary Lily Walker commemorative events. This amazing charity team has planned an (almost) authentic 6-course Edwardian meal. It starts with Arbroath Smoked Haddock Souffle, moves on to Carrot & Star Anise Soup, and (almost) ends with Carse of Gowrie Raspberry and Cranachan Dessert. The meal takes place in the classroom of St Paul's School — one of the schools that featured in Mary Lily Walker's ground-breaking 1905 report. The classroom has only recently been cleared, and so will rarely have been seen by the public. But we really will be eating in the very room in which Victorian children walked barefoot across a wooden floor — and whose lives Mary Lily Walker sought to change with her dedicated work. The Heaven's Kitchen team is made up of volunteer chefs and waiting staff, all of superb and practised skills — who are donating their time and effort to raise money for St Paul's Cathedral. Mary Lily Walker herself attended St Paul's Cathedral and was buried from there on 5 July 1913. So it is fitting that we join her spirit there on 1st June, to kick off what is now a month of celebrations to mark her contributions to the city of Dundee and especially to the lives of Dundee children and women. For more on Mary Lily Walker, her life and her legacy, check out the rest of our blog here at www.marylilywalker.co.uk. There are still tickets available for many of the events taking place in June, so do get in touch if any other events interest you. We've attached a flyer for the Banquet, so that you know how to book (at £35 per ticket). Don't forget to read the bit about the 'Required Dress Code'. :) It should be a fabulously fun evening. We look forward to seeing many of you on the 1st of June — as long as tickets last! PLEASE FORWARD THIS EMAIL ON TO ANY LAIRDS, LADIES, RASCALS OR SCOUNDRELS WHOM YOU THINK MIGHT BE INTERESTED IN ATTENDING.